Bob Woodward, the Pulitzer Prize-winning journalist, will speak at the Belo Center for New Media on Wednesday afternoon. Few people embody true journalistic intentions more so than Bob Woodward. The impact of his work when covering the infamous Watergate scandal inspired a new era of investigative reporting. 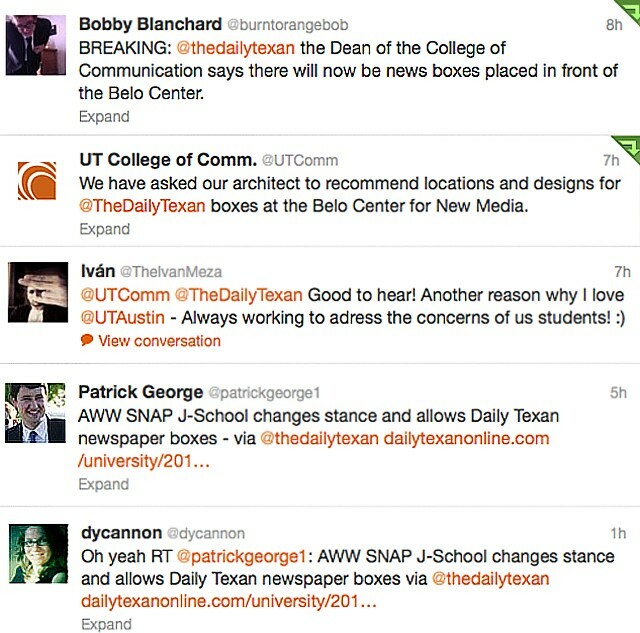 This Wednesday, Woodward will participate in a speaking event at the Belo Center for New Media. This event is part of the continuing series of guest speakers celebrating the centennial of the School of Journalism. The discussion will be a Q&A session between Woodward and R.B. 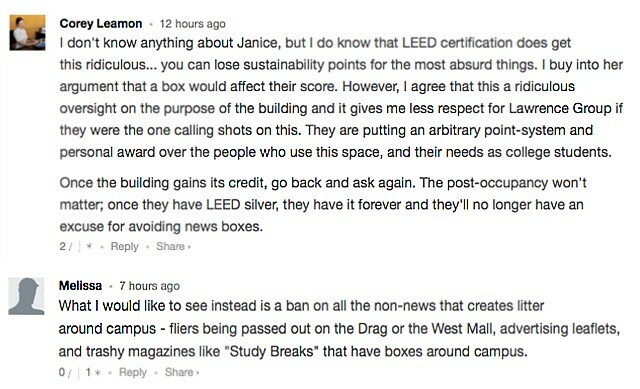 Brenner, the director of the School of Journalism. Brenner said, even though much has changed in the American political realm in the last 40 years, Woodward has remained a constant and is able to give a unique perspective on a variety of issues. Brenner hopes to discuss a variety of topics — from general questions about changes in journalism and transparency within the presidency to more specific questions about current events. Woodward plans to address the lack of transparency between the press and the presidency from his beginnings as a journalist with the Nixon administration to the present. “We may be going through one of those hinges in history where big decisions have been made that set the country on a path that is defining,” Woodward said. According to Wanda Cash, the associate director of the journalism school, the event is timely in light of Obama’s decision to send strike forces to defeat the Islamic State group. Citing Woodward’s extensive knowledge on how Bush handled the war in Iraq and Nixon’s ending of the war in Vietnam, Cash said that Woodward’s perspective provides an arc in the story. “Woodward is important to us because [his] and Carl Bernstein’s reporting on Watergate inspired a whole generation of investigative reporters and set so many people on the path to reporting because they were inspired to learn what a couple of intrepid rookies could do,” Cash said. Glenn Frankel, pictured here with his new book, will leave UT after the 2013-2014 academic year. After four years as the director of the School of Journalism, Glenn Frankel will retire from his position and become a full-time author. In an email to his colleagues Thursday evening, Frankel announced he will be leaving UT after the 2013-14 academic school year. In his last year, Frankel said he will focus on transforming the curriculum in the journalism master program and focus on helping a new person transition into his position. Frankel said he will return home to Arlington, Va. and write books full-time, which he says is "a cherished dream." 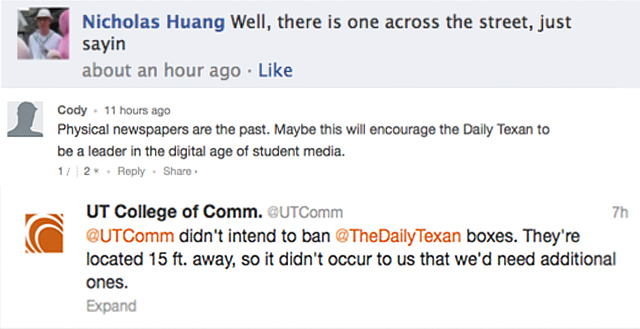 He said the new journalism director needs to be able to demonstrate how journalism is a value to UT as a whole. 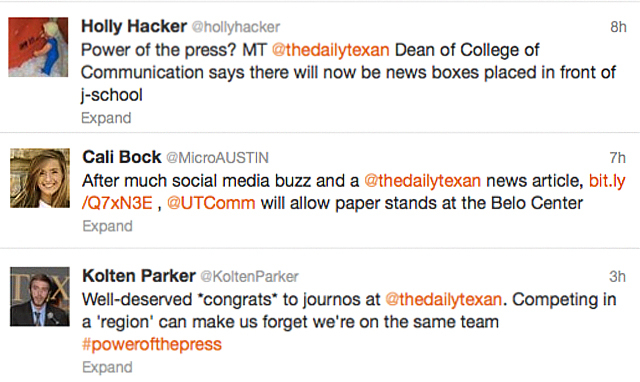 Frankel said the new director also needs to be concerned with the fate of The Daily Texan, which almost cut its printing from five to four times a week this past semester due to budget concerns. 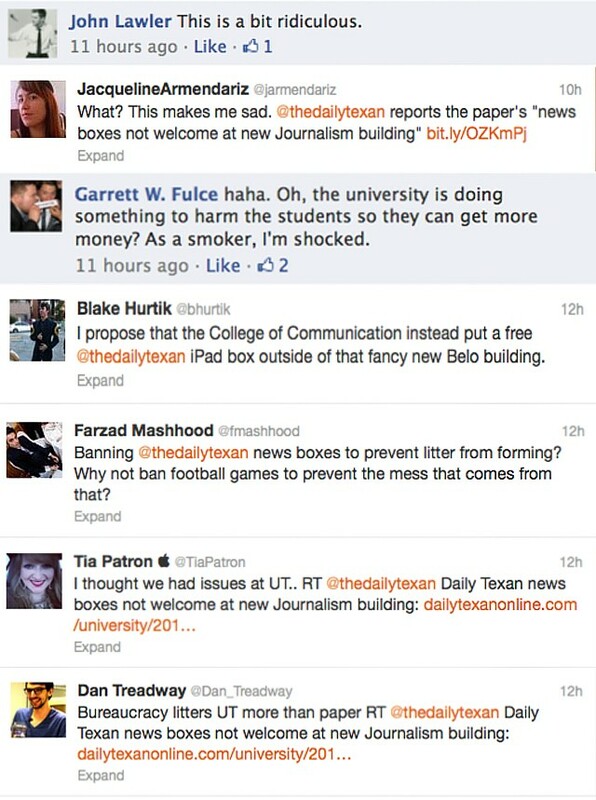 Frankel said the Texan must remain as independent and student-run as possible. "This is a time where journalism needs that kind of support, and all of our former assumptions are up for grabs. We need to reassert and reestablish the critical importance of journalism in a democratic society," Frankel said in an interview with The Daily Texan. "And that's part of the job for the School of Journalism." Frankel, a former Washington Post editor and Pulitzer Prize-winning journalist, was hired as the director of the School of Journalism in 2010. Looking back at the past three years, Frankel said the opening of the new journalism building, the Belo Center for New Media and the launching of the new journalism curriculum were some of his high points of his career as journalism director. In the 2012 fall semester, the journalism school released a new curriculum aimed to better train students to become multimedia journalists and have multiple skills. It was the first time the undergraduate curriculum had been critically changed in two decades, Frankel said. "Our students are getting digital tools from the day they come to the school while still getting basic journalistic sensibility that goes with it," Frankel said. "There are still bugs to iron out and things to get done, but its an enormous achievement." The new curriculum requires students to conduct a professional internship, which Frankel says has strengthened relations between the School of Journalism and professional news organizations such as the Dallas Morning News. 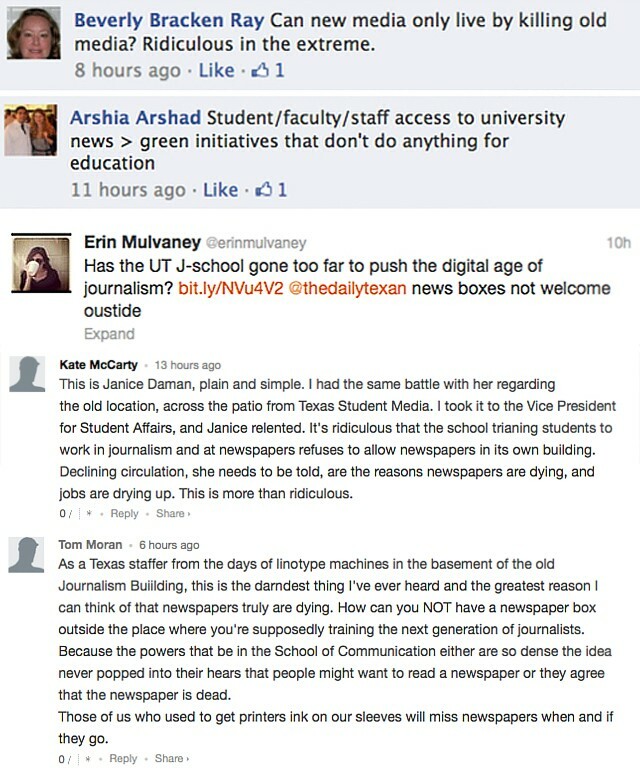 The Morning News recently ran six stories about race in school classrooms by UT students writing for Reporting Texas, a journalism class at the University. Despite these gains, Frankel said the school needs to form even better and stronger relationships with these news organizations. "There is an enormous opportunity here to be a spokesman and a champion of good journalism and the value of good journalism," Frankel said. Frankel said he was convinced now was a good time to retire after receiving positive critical response on his most recent book. "The Searchers: The Making of an American Legend," was released in February. "I want to be a full-time book writer. I've written three and I've got several more in mind," Frankel said. "It just seems to me the success of my newest book has given me the opportunity to do that." Some UT professors are integrating technology and online tools like social media with traditional teaching methods to encourage participation and performance in class. Psychology professors Sam Gosling and James Pennebaker have aimed to encourage student involvement in class by offering online discussions. This fall, the professors require students in their Introduction to Psychology courses to bring their laptops to class to take quizzes, complete assignments and participate in small discussion groups. Some professors in the School of Journalism have also embraced the technology route and require students to use social media in class. According to an October survey by education services company Pearson and the Babson Research Survey Group, nearly 34 percent of 4,000 professors surveyed use social media in their teaching. The study found blogs and wikis were professors’ most preferred social media tools. Eighty-eight percent of faculty also use online video in their classrooms. Gosling said he has seen an improvement in performance from students in his introduction class, a large-format class with more than 1,000 students in the course. He did not require students to purchase a traditional textbook, instead using online demonstrations, TEDTalks, journal articles and other online texts. Wanda Cash, School of Journalism associate director, said encouraging student participation in big lecture classes is a difficult task. She also requires students to tweet comments about lectures during class and created Facebook pages for her classes where updates and relevant articles are posted. The School of Journalism now requires students to create a digital portfolio, which Cash said functions as an online resume. Journalism senior lecturer Robert Quigley said he uses a variety of tools in his social media class, including Facebook and Twitter. Throughout my journalism education at UT and various internships, I have firmly believed that journalism is not dying but rather is changing in new and exciting ways. As I prepare to graduate and enter the professional world in one month, it is comforting to see those changes acknowledged at the School of Journalism. The department is undertaking the biggest change to its curriculum in almost 20 years and moving across the street to the state-of-the-art Belo Center for New Media. Rather than selecting one structured track in topics such as print or broadcast, students will now undertake five levels of coursework where they will learn multiple storytelling techniques, create their own digital portfolio, complete a senior capstone and participate in an internship. Students will also still be instructed in the basics of writing and media ethics. The “new digital-based, state-of-the-art curriculum,” as it is described on the website, is a breath of fresh air for the University and symbolizes the vitality of journalism in both the academic and professional realms. The shift also represents a wave of change toward positive modernization and away from the pessimistic rhetoric that has been plaguing the media environment for the past five years. Multiple journalism schools around the nation, such as Columbia University and the University of Missouri, have also made curriculum changes. Although the new curriculum’s focus on digital skills is essential, it is also instrumental that the department continue to stress the importance of courses that are theme-oriented and provide students with the critical thinking skills they need to navigate complex reporting scenarios. Critical skills, not equipment or video skills, help a journalist report a story in a thorough way. Even more of these courses should be added to the curriculum. During my four years at the School of Journalism, it was the courses that taught me about journalism’s role in historical, international, political and social processes that I found most valuable. Through my certificate in Latino Media Studies, I learned about the press’s role in Hispanic and Latin American communities. These types of academic opportunities help give the contextual knowledge needed to effectively report a multifaceted topic. The department must also expand its study abroad opportunities and internship partnerships across the country. Annual summer internships at local and national news organizations could be set aside for UT students. A journalism career fair organized in partnership with prominent news organizations would also be very beneficial to graduating students. The school currently supports three short study abroad programs in China, the Czech Republic and Austria. In order for students to report about the world and their communities, they must see the world. International experiences, alongside skills acquired in the classroom, will help create even more well-rounded journalists. As I have discovered in my undergraduate career, the traditional lines of print, broadcast and Web are long gone. The path is now the convergence of all of these. This merging has created an industry that is exciting, quick, creative and challenging. This path does not lead to death, as many would like to believe, but opportunity. There are now unparalleled ways to tell stories in even more engaging and powerful mediums. Students at journalism schools are now at the center of this change and can even be creators of new storytelling techniques. Although I will not be able to take advantage of the curriculum changes, I am proud to be part of a department that not only embraces change, but creates it as well. I am looking forward to seeing the results in future generations. Macaya is a journalism and Latin American studies senior.